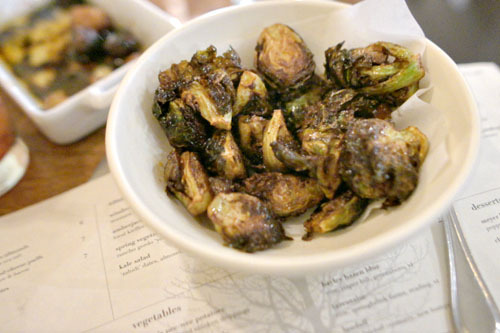 Since debuting at the end of 2006, Josh Loeb and Zoe Nathan's Rustic Canyon has firmly established itself as one of the top restaurants in Santa Monica, mostly under the tutelage of Chef Evan Funke. 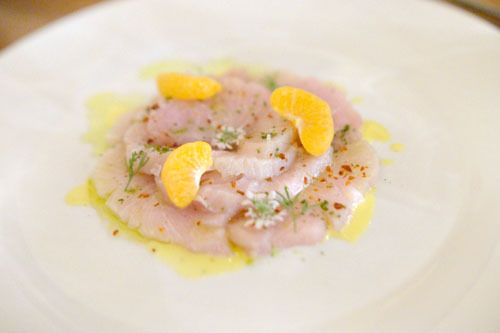 Funke, however, left early last year to pursue his own solo project: Bucato in the old Beacon space in Culver City. 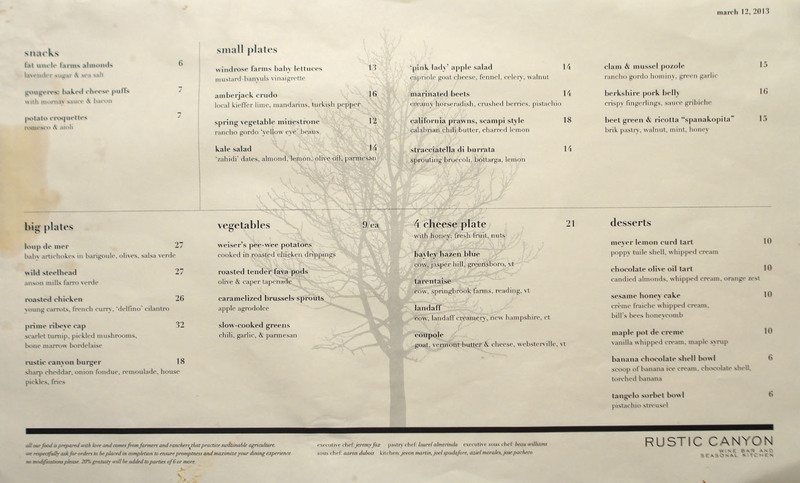 Rustic was without a head chef for a few months before Jeremy Strubel (Momed, Public, Libertine) took the reins in June 2012. He ended up decamping this January though, and is now working at Italian newbie Sirena. Strubel's replacement came as a bit of a surprise: none other than Food & Wine Best New Chef and former Ubuntu frontman Jeremy Fox. His tumultuous departure from the veggie-centric restaurant came in February 2010, amidst a divorce from the place's lauded Pastry Chef, Deanie Hickox (Plum, Coi, Manresa). In April that year, he cooked a one-off dinner at James Syhabout's Commis (the two worked together at Manresa), then gave Angelenos a taste of his talents at a sold-out dinner at Animal in May. From there, Fox quickly secured a position at Daniel Patterson's soon-to-open Plum in Oakland, with plans to lend his skills to Bracina and whatever other projects Patterson had in mind. They got as far as serving practice dinners at Il Cane Rosso in the Ferry Building, but Fox would leave by August, replaced by Charlie Parker. 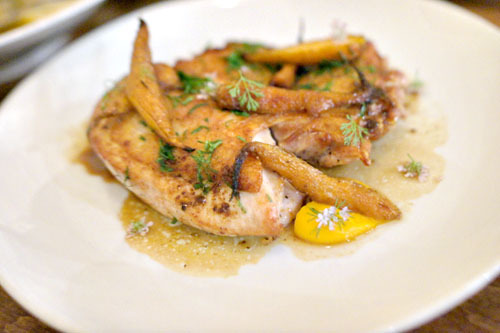 After participating in a "fire dinner" with Joshua Skenes (highlighting Saison's wood-burning hearth), he landed a gig as the Creative Director for Tyler Florence's restaurant group in October, and became a partner in Florence's Rotisserie & Wine in Napa, with responsibility for his other properties El Paseo and Wayfare Tavern as well. Though his post was certainly promising, Fox left in February 2011, around the same time announcing a cookbook project (Seed to Stalk: A Modern Culinary Handbook by Phaidon), its concomitant Yountville garden (started in partnership with wine maker Ryan Hill and French Laundry gardener Peter Jacobsen), and a series of pop-up dinners. The first of those pop-ups took place on March 28th, set inside Dominique Crenn's eponymous Atelier Crenn. That was followed up by a multi-day stint at Saison in June (where he was joined by Ari Taymor's mentor Kim Alter and Top Chef's Eli Kirshtein), as well as a night at Orson in August. It was during this period that Fox announced that he was searching for a location to house a veggie-focused eatery called Smith. That never came to fruition, however, and the Chef ended up moving to Los Angeles later that year, settling in Los Feliz. 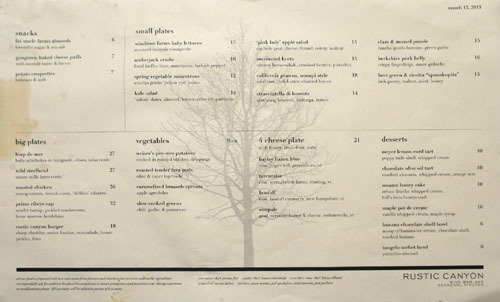 In November 2011, Fox was reunited with Manresa compatriot Charlie Parker when he began consulting at Freddy Smalls, though he ceased his involvement after the place's opening in December, and also started looking for a spot on the East Side to house the aforementioned Smith concept. The next May, he commenced a brief consulting gig at Paper or Plastik, and then announced the intention to sell a line of lavender-scented almonds at Cube Cafe & Marketplace under the Fox Fine Foods label. In July, word came about Barnyard, a restaurant in Venice where Fox would be partner and Executive Chef. It was an exciting announcement, and in October he even teased his menu during a night at the latest iteration of Test Kitchen at Bestia. However, the following month, the Chef gave news of his departure from the project, much to our dismay; it was ostensibly a result of a falling-out with management, and he was soon replaced by Jesse Barber of The Tasting Kitchen. With Barnyard out of the picture, Fox partnered with Helen Springut and Helena Brown's culinary incubator this is not a pop-up to launch Old Soul, a weekly dinner series set inside Square One Dining in Hollywood. The trio actually managed to stay together long enough to host a number of events last December, but plans to return in January 2013 were foiled when Fox pulled out of the uneasy alliance and moved to Rustic Canyon in February. It's been a busy three years. Chef Fox has definitely put his mark on the menu here at Rustic Canyon, with perhaps the legendary burger and the cheese plate being the sole holdouts. Things are arguably a touch less rustic as a result, but the place's seasonal Cal-Med vibe remains intact. Click for a larger version. 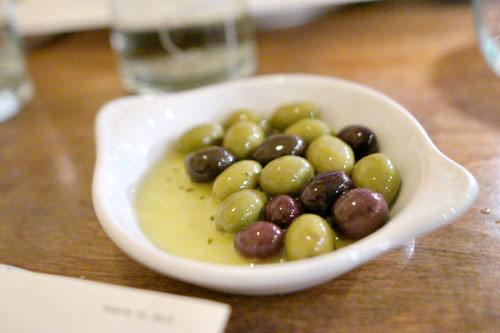 To start, what else but the restaurant's signature plate of olives? Croquettes were just as you'd expect, with crisp exteriors hiding soft, pillow-y insides imbued with a straightforward savoriness. 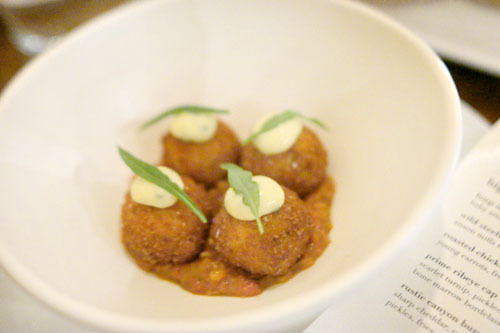 They key here was that romesco, an elegant version of the sauce that offered a piquant counterpoint to the fritters. Gougères arrived looking like miniature baked potatoes, which I'm not sure was intentional or not. 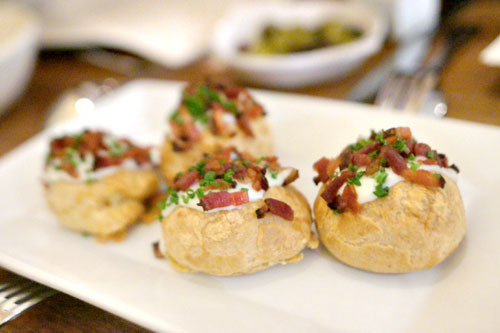 You can't wander too astray with these: delightful puffs of melty, cheese-y goodness interspersed with salty bits of bacon. 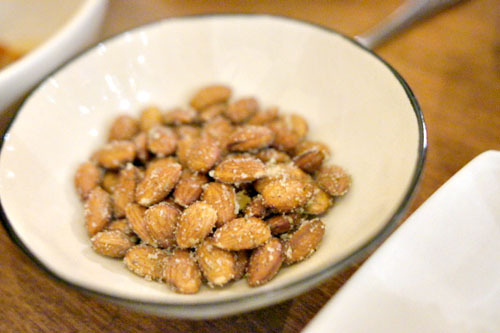 We were then provided a bowl of Fox's signature lavender-laced almonds, which I'd first encountered at Ubuntu (Marconas were used back then). They were just as good as I remember, a lovely back-and-forth between both salty and floral nuances, all over the crunchy backdrop of the nut. To drink, one of my dining companions was in the mood for syrah, so we asked our server to pick out something. 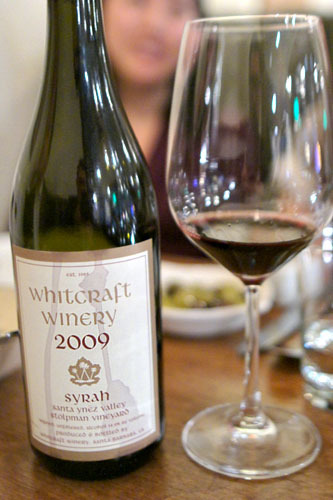 He ended up with the 2009 Whitcraft Syrah Stolpman Vineyard [$80], a limited production (~200 cases), biodynamic bottling from the Santa Ynez Valley. It really was quite amazing, probably the best California Syrah I've had in fact: unquestionably smooth and easy-drinking, yet not banal, with loads of jammy dark fruit and an undercurrent of smoky-spice to go along with a pleasant tartness. 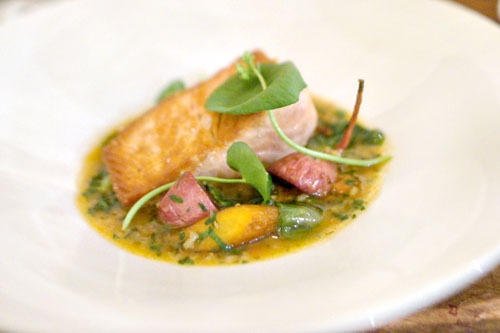 Moving on to some more substantial courses now, we had here Fox's version of the requisite pork belly dish. 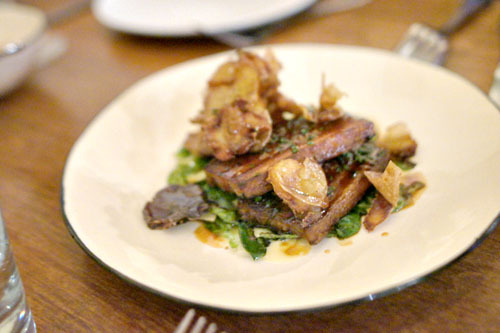 The pork itself showed off a great crispness, with a lovely blend of lean and fat, and I really appreciated the lightness imparted by the greenery, as well as that tangy dressing of gribiche. 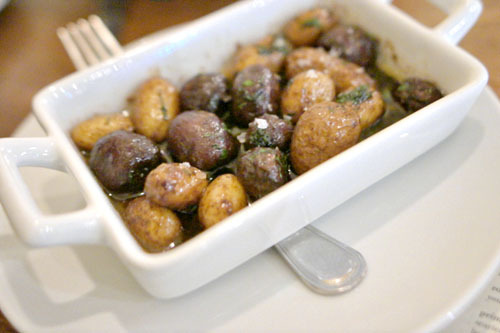 However, the potatoes were almost too savory here, stealing some of the belly's thunder in effect. My favorite course of the night came in the form of pozole, which just might've been the best version of the stew I've ever had. The combo of mussels and clam provided a superb undercurrent of brine to the course, and were great texturally, especially in contrast to the firm kernels of corn. Add to that the bright, verdant flavors of the broth and the crunchy bits on top, and you get a perfectly balanced dish that I wanted to just keep eating. 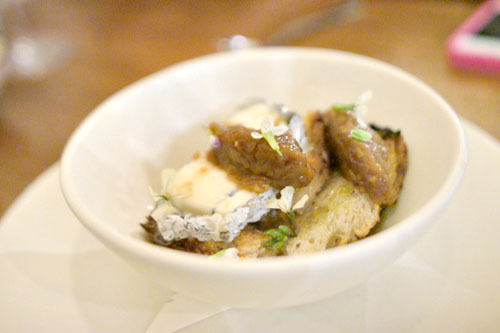 Next, we tried a new dish that Chef Fox was toying with, composed of country toast topped with Capriole's Sofia goat cheese and onion jam, doused in a chicken consommé. I got a lot of the sweet onion initially here, which then merged, seemingly out of nowhere, with a slight funkiness from the cheese toward the end, all over the base of heady chicken broth and moderating toast. There were some really cool flavor transitions going on, though the bread did get a bit soggy. 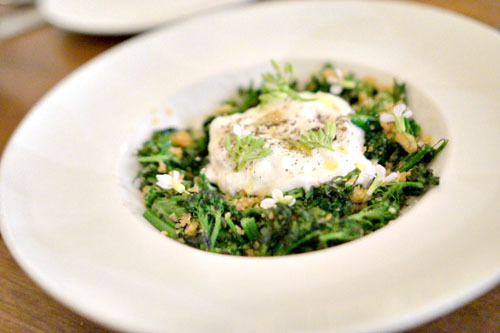 One dish that wowed me was Fox's version of sprouting broccoli, my favorite presentation of the ingredient to date. The crisp, bright, bitter goodness of the veggie was proudly conveyed, masterfully complemented by the weighty bottarga and luxurious dollop of burrata, while the icing on the cake was the dish's subtle, creeping spice. Amberjack arrived fresh 'n' clean, supple to the bite and imbued with an overarching sourness courtesy of the kaffir. The sweet, succulent segments of mandarin worked out beautifully here, though I'm not sure if I liked the Turkish pepper or not. It added an interesting spicy counterpoint that seemed to highlight certain qualities of the fish. Previously, Rustic Canyon was a beer & wine only type of place, but since my last visit, they've acquired a full liquor license, hence the cocktails. I started with the Blood and Sand, a great choice, showing off a flawless integration between the scotch and the cherry, all tarted up by the sweet, spicy zing of the Byrrh. Wonderfully balanced, and super easy drinking. Moving on to mains now, we began with some last-of-the-season steelhead. The trout was cooked perfectly, slightly rare, yet crispy on the outside, with a delightful salinity to it. I wouldn't have minded eating it alone, but the farro and associated greenery definitely made sense as a counterweight in the dish. Pee-wee potatoes were about what you'd expect, heart and filling, though I would've liked some more chicken character to have permeated the taters. We then sampled a homemade morcilla that Chef Fox was working on, served with rhubarb and turnip. 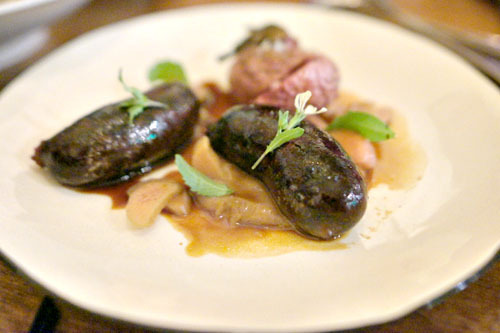 It was one of the best blood sausages I've eaten, though not necessarily what I was expecting with morcilla, coming out more along the lines of a boudin noir, displaying a soft, supple consistency and a restrained, though still properly earthy savor. The sweetness of the rhubarb worked out here, as did the bitterness of the turnip, though texturally there could've been something more, something tempering with a bit of crunch. 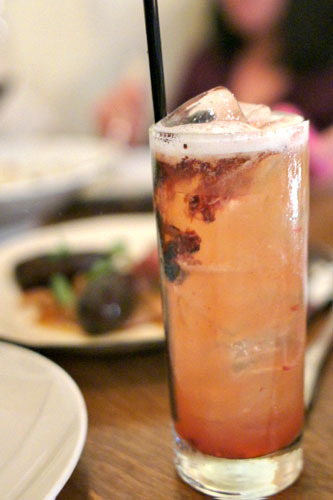 Named after co-owner Josh Loeb, The Loeber was another great addition to the cocktail program. 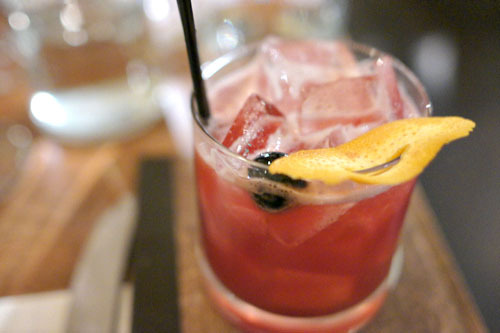 The Bourbon formed a superb base here, with its boozy weight balanced by the sweet honey and sour lemon, all while the blackberry contributed a delightful fruity edge to the drink. Brussels sprouts were right on the money, flawless in texture, with a great mix of sweet and sour flavors to go against the bitterness of the vegetable. In fact, one of my dining companions stated that this was her favorite preparation of Brussels, ever. We were told that this was the Chef's favorite main course, and with good reason. The bird came out tender and moist, almost teeming with juice in fact, with a spot on chicken-y flavor that paired masterfully with the curry (which I was afraid would be overwhelming). The cilantro, meanwhile, added a great herby whisper to the dish that served as a fantastic accent piece. Desserts here at Rustic Canyon are the charge of Pastry Chef Laurel Almerinda, and we went with a trio of her creations to end the meal with. The cake above showed off a delectable sesame flavor, offset by the sweetness of honey, but was on the dry side. 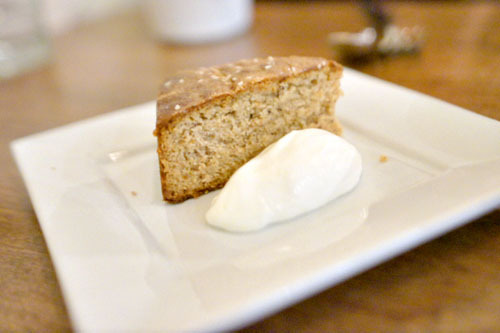 Fortunately, the whipped cream helped with that, and added a certain lightness to the dish to boot. 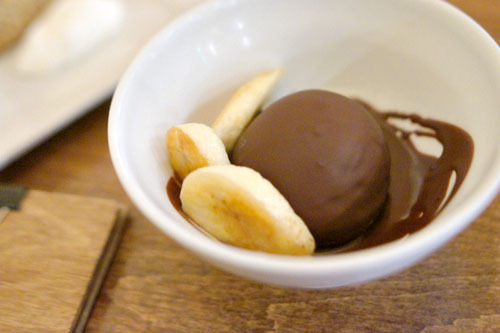 Banana ice cream conveyed the pure, unmitigated essence of the fruit, its sweetness melding well with its chocolate-y sheath, while the caramelized slices added even more sugary goodness. A must for the banana fiends out there. 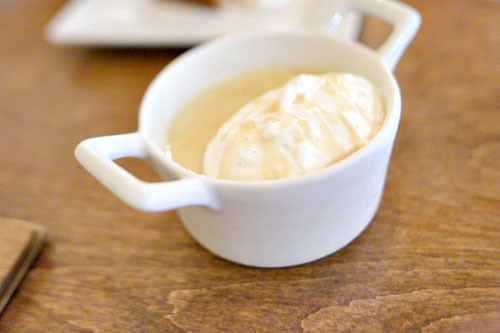 To end, a lush, luxurious pot de crème of maple custard gave us a satisfying sweetness to pair against the whipped cream. Can't go wrong with this. Under the guidance of Jeremy Fox, Rustic Canyon appears to be as strong as ever. The food's definitely imbued with his style now, and perhaps veers less toward rustic, but possesses a more venturesome quality to it. It's not necessarily better or worse than what his predecessors put out, but different, and quite to my liking. The Chef isn't known for staying in one place too long (as witnessed in the considerable movement described in the introductory paragraphs above), so hopefully his tenure here lasts a while. I'd go check the restaurant out quickly though, just in case Kosher Pig (with Cube buyer Rachael Sheridan) comes to fruition. 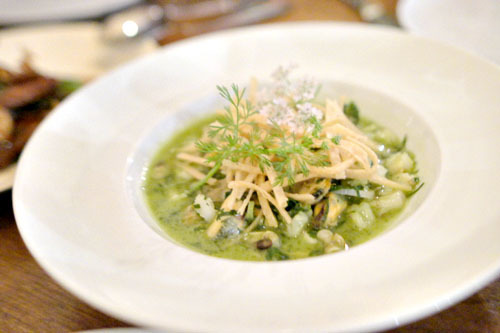 We dined at the French Laundry on Saturday with Chef David Breeden firmly at the helm. Our server even mentioned that Chef Hollingsworth was to be dining later that same evening. After 15 courses and a full sized chocolate ganache "cake" with gold dust on the top baked for my wife by Pastry Chef Milton Abel, we were treated to a kitchen visit where we exchanged a few pleasantries with Chef Breeden as put the finishing touches on the Hawaiian Big Eye tuna course at full speed. We were then presented with a box containing the nearly complete remainder of our chocolate cake. Interestingly, relatively new GM Michael Minnillo served the majority of our wine pairings that evening. He takes over after Nicolas Fanucci's departure to run the legendary Le Bec Fin in Philadelphia. In all, I more than happy to report that TFL has maintained all of its swagger. Having dined under both chefs, I can easily say that Chef Breeden's food was creative, enticing and flawlessly executed. He is using some outstanding ingredients I have not seen TFL using in years. Branching out from the classic lobster course to include hand collected scallops and Alaskan King crab.